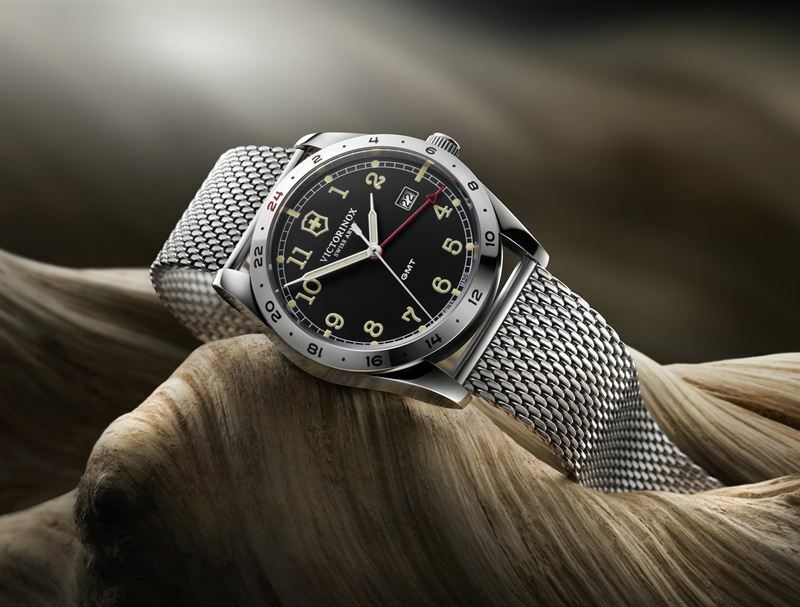 Victorinox Swiss Army expands 2014 Infantry collection ideal for long distance travelers. Classic, robust, practical and multifunctional, Infantry GMT is equipped with a quartz movement in lacquered dark grey dial and features a complication that allows one to track local time and the hour back at home. As its name suggests, Infantry GMT indicates a second time zone depending on the choice of the wearer - a much appreciated function for world travelers. Along with the dial’s hour, minute and second hand is a red central hand marking the hour in the second time zone. The second time zone numbers are engraved on the bezel, with the number 24 printed at noon in Victorinox red, the same iconic color used on many of the brand’s classic knife cases. In every way, Infantry GMT remains faithful to the qualities that have made the line a success. The 40mm stainless steel case retains its fluid and clean lines. Stylistic references are principally drawn from the world of military watches, but with retro appeal. This is particularly evident in the design of the indexes, which are inspired by old typewriter fonts. Powered by Swiss Made Ronda 515 quartz movement and comes with an ecologically tanned brown leather strap or a Milanese-style steel bracelet, Infantry GMT is available at select Ahmed Seddiqi & Sons and 1915 by Seddiqi stores. For more information on Ahmed Seddiqi & Sons, please visit: www.seddiqi.com.